Since 1998 we have a great pleasure to host tourists from homeland and overseas in Gawra which is still extend. 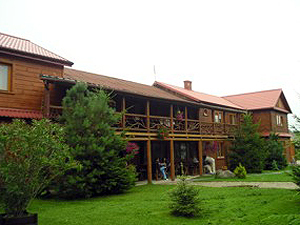 As the only owner of this type of boarding house we come from Bialowieza primeval forest. We will help you to show their colour of culture and their traditional taste. We are educated foresters so we try that our guests get to know the best the unique atmosphere of the natural forest. 2 chimney halls, small – 25 p..; big – 50 p.
Secure and charge-free parking lot. The hostel can accommodate up to 50 people. At the reception we speak in: English, German and Polish. in the rooms: bathrooms, TV, wireless Internet, one special room with its own chimney. Rooms are furnished with high-standard wooden furniture. Every room has its own, custom and unique décor. In room you can find bathrooms, TV SAT, a fridge. three-person room – 150 zl. four-person room – 150 zl. Three-person apartment – 190 zl. Fee for a neat dog: 20 zl. Breakfast: 18zl, lunch: from 25 zl. We grant discounts for long stays. Group prices are negotiable.